Fill out a form for planning wise. Then you will be redirected to products page. Select the type of development / application, customise it and add to your basket. Once on your basket you will be able to see all the selected products and totals, request a call back regards your basket or place order and proceed to checkout page. Once you are happy to proceed with your order we will send you a confirmation email with your order details. You can manage your orders and personal information on "My Account" section. Explore our smart quotation system and add products that suites your proposed development/application. Drawing and Planning have successfully secured a Planning Permission for the construction of a single storey extension to the rear of 50 Cranfield Road, SE4, in addition to a replacement dormer and a new conservation style rooflight to the rear roofslope. 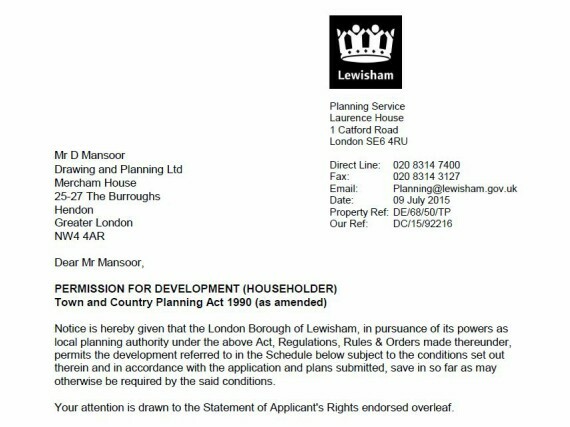 Need Planning Permission? Call us today on 0208 202 3665 to talk to one of expert consultant and learn how we can help you get Planning Permission. PROJECT Single storey extension to the rear of 50 Cranfield Road, SE4, in addition to a replacement dormer and a new conservation style rooflight to the rear roofslope. Your basket will be saved and you'll be given a link. You, or anyone with the link, can use it to retrieve your basket at any time. Empty Basket. Please add products before saving. Your basket will be saved with the selected products and totals. Then send it to yourself, or a friend, with a link to retrieve it at any time. Your basket email sent successfully!